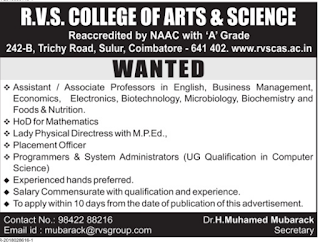 R.V.S College of Arts & Science, Coimbatore has advertised in DINAMALAR newspaper for recruitment of Associate Professor / Assistant Professor jobs vacancies. Interested and eligible job aspirants are requested to apply with in 10 dayd from 15th April 2018. Check out further more details below. 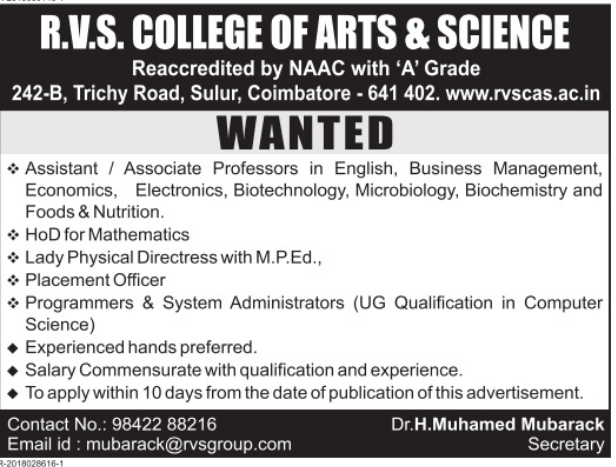 Name of the College : R.V.S College of Arts &Science , Coimbatore. About College: RVS College of Arts and Science, affiliated to Bharathiar University, Coimbatore offers career-oriented educational service leading to graduation, post-graduation and research degrees in Arts and Science disciplines. Founded on 31st OCT, 1986, it has grown exuberantly to become one of the biggest self- financing colleges. The college was accorded autonomous status in 2004 by UGC and re accredited in 2014 with 'A' Grade. Besides, the institution is credited with ISO 9001-2008 certification. How to Apply: Interested candidates are requested to send updated CV along with copies of certificates and recent passport size photo to the email address and postal address provided below.